Choose your usual U.S. dress size (00-20). Free returns and exchanges. For sizing assistance: Reach us via LIVE CHAT or by email at ciao@shopravella.com. Bust 32" 33" 34" 35" 36" 37" 38" 39" 40.5" 42" 44"
Waist 24" 25" 26" 27" 28" 29" 30" 31.5" 33" 34.5" 37"
Hip 34" 35" 36" 37" 38" 39" 40" 41.5" 43" 44.5" 47"
*Petite sizes are designed for women 5'4" or below. 1.5" shorter sleeves than regular M/L size. Our model is 5'7" and 120 lbs. She's wearing a size XS. Only 9 left - order soon. This essential silk blouse is true closet classic. Detailed with elegant natural mother-of-pearl buttons, she's just as perfect for work as she is for the weekend. Setting the standard for effortless sophistication, this is the one timeless silk shirt every woman should own. Beautiful flat mother-of-pearl buttons in matching color. Hits just below the hips. Perfect for tucking. Returns and exchanges for all U.S. orders are accepted for unworn garments within 14 days of delivery for a full refund and with free return shipping. Learn More. Free shipping on all U.S. orders (3-5 business days for most orders). Express and international shipping options available at checkout. See more. Orders ship within 1-2 business days (Mon-Fri, excluding holidays). Hand-wash, machine-wash on delicate, or dry-clean. Learn More. Air dry. Do not tumble dry. Steam any creases or iron on low setting. Steam any creases. Do not iron. 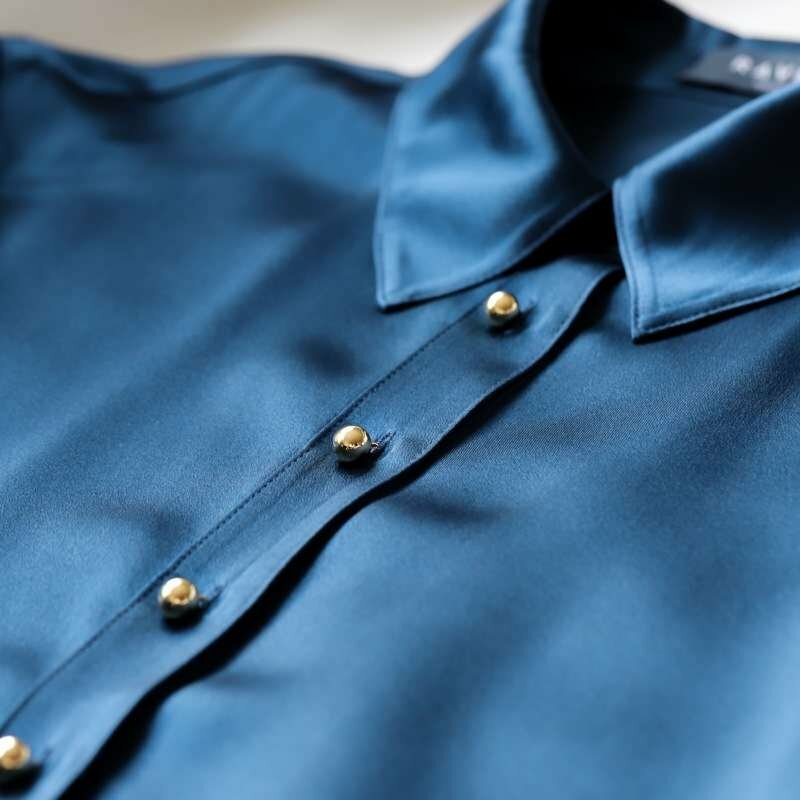 The MONACO is a minimalist silk blouse detailed with beautiful natural mother-of-pearl buttons for a sleek, classy look. A timeless essential you'll love for years to come. 100% Pure silk. No other crap. Our ultra-premium silk is 40% denser and stronger than your average silk. Result: Long-lasting silk with the perfect thickness so it isn't see-through. The charmeuse fabric elegantly drapes over your body, with a beautiful sheen and buttery softness that makes you look and feel like a million bucks. When we say luxury we mean it: our silk is made by the same craftsmen and factories used by the world's top luxury brands. Every finished garment is diligently inspected at least 4 times to ensure you receive nothing short of true luxury craftsmanship. We’re confident you’ll love our silk blouses & tops. If you’re not 100% happy with your purchase, we'd love to help. Returns and exchanges are free and easy. at the bottom of your screen. Glad to help double-check your size. Enter your (1) height, (2) bra size, (3) usual dress size, (4) weight and (5) any special fit comments. Returns and exchanges are free within 14 days for all US orders. Shipping is on us, both ways.